When I was a child, I loved my father so much that I was convinced that when he died, I would die. Even after I got married, I continued to believe that my father was the one person who loved me unconditionally, and that without him, love would disappear. When he was diagnosed with stage 4 lymphoma a few years ago, I was devastated. And I was faced with a dilemma: I could bury myself in food, or I could actually let my heart break--the way it was already breaking--and see if I could survive what I never thought I could. Recently, I worked with a woman struggling with the same conflict. Six months after the unexpected death of her 30-year-old husband, she had a 32 pound weight gain. She said she couldn't stop eating because if she stopped eating, she'd start crying, and if she started crying, she'd never stop. She believed, as I once did, that if she let herself feel the depth of her emotions, her sorrow, she would break like an antique porcelain doll and never be whole again. When I asked if she had ever felt anything that had never ended, she said no. When I asked if the 32 pound weight loss was lessening the grief, she said no. "Now," she said, "I am grieving about two things: my husband and my weight." So I asked if she would be willing, with my support, to allow herself to cry for exactly 4 minutes and see what happened. She was. I set my stopwatch. Three minutes and 45 seconds later, she stopped crying. "Oh my God," she said, "there was an end. Maybe just a temporary end, but still, an end." She began to understand then that emotional eating was, paradoxically, a way to both bury and extend her grief: If she kept eating, she'd never have to actually feel her grief. And if she were fat, then she'd never feel attractive enough to get involved with any other man. That way she could always stay loyal to--and grieving for--her husband. Many of us believe that if we let ourselves experience our emotions, we will shatter. We will never get out of bed, go to the bank, or feed our kids. But in my own life and in my work with thousands of people struggling with weight issues, I have discovered that none of that is true. Most of the time, feelings don't break us. No matter how terrible something is--even the death of someone we love--what damages us, makes us brittle, and turns us toward food is avoiding the emotions and not allowing them to surface. It is fear of emotions that is at the root of emotional eating, not the emotions themselves. Try this experiment: Become aware of what you are feeling at this moment. Notice how it affects you to be paying even this much attention to a feeling. To give it space. To be curious about it. To be treating yourself kindly. If you're like most people, you're starving not for food, but for attention--your own attention. Just spending a minute or two with yourself, noticing which emotions want to be heard and how they affect you, is a great way to begin feeding those parts of yourself that are starving to be noticed. Eventually, you'll learn that you can let yourself feel what's there instead of stuffing it down with food. And you'll see that you come out on the other side with more of yourself, not less. A Zen teacher once told me that we come into this life to lose everything we love, including our own bodies. I didn't like him very much after he said that. I wanted to argue with him and insist that surely there is a way around loss, heartbreak, and death. And at one time in my life, there seemed to be: Emotional eating creates a major distraction and bypasses the rawness of being alive. Eating helps numb the pain--but if you don't allow yourself to experience your own feelings, you will be sleep-walking through your life. My book, The Craggy Hole in My Heart and the Cat Who Fixed It, is about loving and losing my father and another great love of my life, my cat Blanche. Since I am telling the truth here, I will admit that as they were dying, I had a few minor episodes of retail therapy, and ate a little more chocolate than usual. But mostly, I cried. And in the end, I was incredibly grateful for their lives--and for this whole messy, glorious existence (as well as that fabulous pair of earrings I bought across the street from the hospital where my father received chemotherapy). What does loving and losing a dad and a cat have to do with emotional eating? Everything. Because it's not just the biggest losses we try to avoid by eating. It's also the everyday deaths--the disappointments, the illnesses, the rejections, the hurt we feel when life does not turn out the way we'd hoped. Once we realize that we will survive the sadness and hurt, we don't have to deaden ourselves with food. And we can discover that our tender, vulnerable hearts are bigger and more resilient than we ever imagined. Thank you for this article. My father was always my “hero” and I never thought I could survive without him. He is now 87 and has moderate staged dementia. You’ve helped reassure me that I will be able to survive the loss…I AM surviving what has been lost already. And I even feel as he gets worse that I don’t want him to suffer and would choose being without him as much as it overwhelms me. I’m trying not to binge when I have these feelings that I think I can’t deal with. I’m going to carry this article around with me! And get a copy of The Craggy Hole in My Heart and the Cat Who Fixed it. You’ll want to carry that around too like I do. Much more in there about Geneen going through the death of her father. Although it’s been 6 or so years since my last retreat, your works, postings and books continue to be a major support in what I’m working on. Although I don’t numb with food much anymore, I notice I do it in other ways, so for the sake of this one glorious life – and all those I love and want to be in connection with (including myself) I continue the work. Your articles continue to amaze me! I feel like every single one of them applies to me, however this one especially touches my heart having lost my father 9 years ago; a loss that some days I feel I can’t accept. I have always felt alone with my struggle with emotional eating however after reading your articles I feel much better knowing that I am not the only one who feels the way I do. Bless you! This resonates with me. I spent 20 years eating and grieving for the loss of my father because I never knew it was o.k. to grieve. I never learned to just sit with my feelings and let them process through me. Instead, I stuffed it all down. When my mother passed away two years ago, I let myself feel it and grieve it and it was a very cleansing process and better way of handling it. Surprisingly, I got through it without gaining weight – in fact I lost a few pounds. I know I still have a ways to go to learn how to feel my feelings instead of stuffing them, but I am making progress. Your books have all been a great inspiration to me! Thank you for writing and sharing those raw details of your life that we can relate to. oh boy…..this spoke straight to my heart. I’ve always felt I have TOO much emotion, so much that if I let it all out, I would scare myself and all my loved ones to boot. Have been told I’m too ‘sensitive’. My emotions will overwhelm me and family will get tired of the tears, of the sadness that sticks to me. How will I function if I don’t stuff the emotion down with food? If I let go and un-numb myself, step into the pain instead of side-stepping it, will it really have an end? On the flip side, I can also feel great joy and I have allowed myself to experience that daily, but the pain part….it’s so true about having to think about the pain and now the weight gain as well – now there’s 2 buddies side by side to beat myself up about. 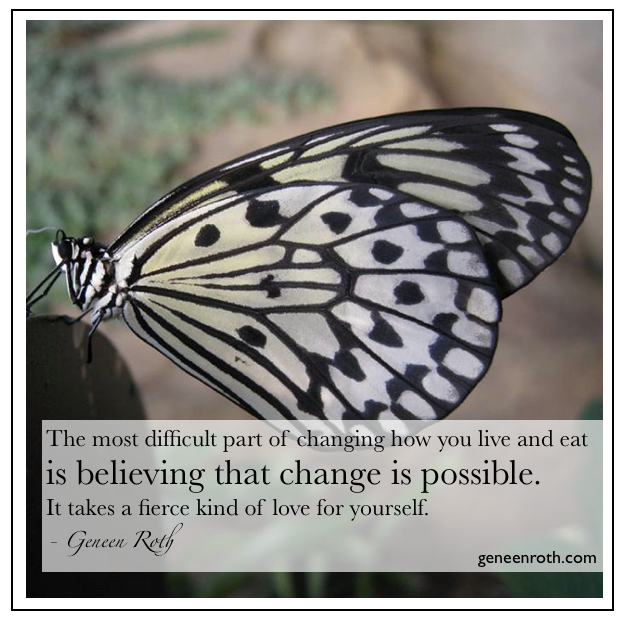 Great food for thought…..
Geneen, you have such a brilliant way of writing. The Zen teacher left me giggling and the earrings smile like a Cheshire cat. And as always so true and to the point. I really love it. What an intensely profound piece of writing. I want to read it over and over again until I integrate it. Lovely. Thank you. Thank you, I needed that. I lost my father 18 years ago to esophageal cancer, then my favorite uncle (second father figure) to lung cancer 18 months ago and now my father-in-law has been diagnosed with metatastic melanoma. I’ve been out of control with my food until just this week. I had a small group chat with Jane that changed all that. I started to cry and realized that I felt if I started I’d never stop, but I did, I stopped, and then I started again and this week I’m trying to allow myself to feel the pain and I’m surviving. You are my hero.I bought your first books 30 yrs ago and only now are really truly believing there is no other way through this suffering. Thank you Geneen. Your work has been inspiring me and guiding me since the 90s. I appreciate your depth, insight, humor and intelligence. Dear Geneen: I am so sorry for your loss. I too felt that I would not survive the loss of my mother. She left this life in November of 2013. After her death I would cry and actually feel as if I were going to die from grief. 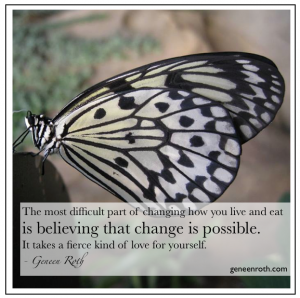 I turned to healthy support like counseling and turned to food as well. And through that emotional jungle I have regained my footing and have lost weight and I laugh and love and do my best to be present to my life. I am grateful to you for your wisdom, generosity of spirit and courage. Be well Beautiful Lady!! This was one of the most beautiful and insightful articles I’ve read about emotions. I am not personally an emotional eater, and therefore I am at a good weight, however, I have tried to avoid really “feeling” sometimes with just being too BUSY. You’re right – it just delays the pain and prolongs it. Thank you for your insight it makes me realise that everyone of us on this planet experiences heartache and loss. And that’s OK, it’s part of our existence and growth! I especially like how you said that we are starving for attention – attention from ourselves. So true. Thank you, Geneen! Finally some answers to my awful binge eating. I am grateful!!! This article has answered a question I have been living with but not been able to answer for a long time. When I start losing weight, I get “depressed” because I start asking myself why didn’t I do this years ago? My life (I am 62) would have been different if I hadn’t been an emotional eater. I would have dated more, skied better, climbed more mountains, and made love more… Maybe I would have done those things or not but I definitely would not have lived with so much anger, sadness and disappointment directed towards myself. And that depression of all the woulda, coulda, shoudas sinks me back into my emotional eating. Now I know the answer: face and accept those disappointments and grieve them and treat myself kindly so that I can live the rest of my life free of emotional overeating. I will be more aware of those thoughts and stop, get still and wail, cry, beat the pillow, whatever it takes to let them go. Much gratitude to you Geneen. Beautifully written, again. I think what I loved most about The Craggy Hole in My Heart and the Cat Who Fixed It was the advice to LEAN IN to the grief. Even though I’ve covered this territory with your writings before, reading it again now, and here, makes me feel more courageous as I continue to face my husbands death. We have lived with an incurable cancer for nearly ten years now. So grateful to have you and my retreat friends on my team. Thank you for this, Geneen. I am always reminded of the loss of a beloved pet almost three years ago now. How I buried myself in food to avoid the crushing loss. And how I truly cheated myself out of the chance to grieve for not only what I lost, but what was lost. Geneen, thanks so much for this piece on grief and loss. You make so clear and understandable the whole ‘feeling’ thing. I’m just totally getting to understand how we numb our feelings, in recent couple of years..and part of that is down to your books and writings etc. Keep up good work..so very appreciated. I lost my Dad in 2009. He was a very difficult man but I learned to know him as not just “Dad” but a complex man with a complex life that had a lot of disappointment and loneliness in it when he was growing up…creating an emotional disconnect in him. His death triggered such an emotional upheaval. Yet, I cannot cry. I try and I have not grieved him yet. A year later, I lost a beloved Aunt and I have not grieved her either. The emotional eating that goes on has ravaged my body, and now I really fear for my health. Grief should not be underestimated. Love should never be underestimated. I don’t know what else I have to say. Just had to say this. So many truths in this that resonate with me. Thank you. Thank you, my husband passed on the 5th of this month of Lymphoma. I am trying to let myself feel it. There were a lot of distractions in the beginning but those are starting to fade. I miss being able to share with him ,so I talk out loud like a mad woman even though there is no one physically present. I am so sorry for your recent loss, thoughts and prayers for you Susan J. Your article caught my attention because I lost my Mom 2 years & I still mourn & try not to cry (but I do anyway). I am like the lady named Janice (above). Everything she said is me exactly! Thanks for the insight! Thank you, beautiful lady. Your books have made me laugh, made me cry, and have validated me in so many ways I can’t even have imagined. You have brought light and wisdom into my life and to so many thousand of others. Thank you for making a difference. I truly thank you deeply for such a wonderful article. I am now, maybe for the first time in my life trying hard to acknoledge my emotions and let them be, the way they feel, the way they are. That is pretty scary,yes! But it has not killed me yet!!! LOL. Anyway,I appreciate a lot your support, love and kindness. Dear Geneen, I am so grateful for your work. You are like a compass, helping me get my bearings. It is so easy to slip back into the very old well-worn path of using food to help numb. It always helps to read your words of wisdom and to be reminded that it is the fear of the emotions, not the emotions themselves, that is problematic. Thank you 1000x over. I think its time to read Women Food and God again! Thanks – it’s a lovely article. I’m sorry for everyone’s many losses. Sometimes I think the loss starts at birth! Yet we never seem to get completely used to it, even though it happens all the time, albeit in smaller ways on most days. The one thing I don’t understand is, what you do if you have absolutely no one to listen to you. I know it’s important to listen to yourself, but sometimes I feel so strongly that I wish I could talk to someone else, besides me. but there isn’t anyone. That’s were the food comes in. It’s a terrible listener, though. I have been a fan for over 30 years… you are the ONLY emotional eating coach that makes total sense…..I have been free , one day at a time, from the grips of emotional eating, thanks to you…. I know myself now like I would have NEVER dreamed possible…please keep writing.. it seems that you are one of the few people on the planet who truly understands emotional eating! You touch my heart since that is exactly what I am struggling with. Food- that is, sugary, salty, fatty stuff- is like an obsession now that my husband and I are splitting up. We have been together for 20+ years: need I say more? I have just come out of a place where I couldn’t stop eating because I couldn’t accept that this was happening. But it is. AND we have to be out of our home by August 31st because that’s when the buyers take possession. I need to be way more urgent about getting the mountain of things that need to be done DONE. Instead I am setting a timer every 5 minutes to break the trance of distracted thinking that is keeping me from staying on purpose. So I will end this now and get back to work. At least I’m not bingeing but I sure don’t have a handle on the thoughts and feelings that precede the urge to have a cooky or whatever. I, too printed this article to carry around. Thanks, Geneen, I love you! Thank you Geneen, this article touches me. As I read through the comments tears started to well up in my eyes hearing the pain in each persons words. I am very blessed to still have my precious parents and spend as much time with them as I can. I try not to think about losing them and I know that is not what I should do. Since going through your online class, I’ve developed a daily practice of meditation and Yoga as well as eating without the TV on in the morning for breakfasts. I love myself, the body God gave me while temporary on this earth I want to treat it with kindness and love that went into making it. I never knew what I was missing until now and it makes me sad that it took me 46 years to find myself again, but thanks to your classes and God leading me to them I finally have. Through listening to Jonathon Foust teachings he’s said to be aware and present is to understand that we are going to die and the people we love around us are going to die. By lying to yourself, you aren’t being present. I use to struggle with thinking about death, don’t get me wrong I still get sad thinking about losing my family and my own body. However, through meditation I’m learning to accept the fact we aren’t meant to be here forever, our home is with God. Thank you so much for all you do and share you have changed my life. God bless you! Thank you, Geneen. Your insights, so beautifully expressed, touch and inspire me. There is so much here I will read this several times to internalize the message. Lately I’ve noticed thinking of eating to fill time and space, and avoiding what can feel like too much alone time. These thoughts and message were so right on time to get back my prospective of what is my true objective. Thank you. I gobble my food fast; I don’t taste it; I eat loads and don’t know when to stop; I just can’t get enough. I am always feeling fat and ugly. I won’t allow myself to feel the awful truth -of what I feel – that I am not enough; the world is not enough; I am not good enough and I spend an inordinate amount of energy numbing myself to those feelings by overeating. I also have a great winning formula in place, a thin veneer of awesome specialness that I present to the world that makes me constantly tired making sure I present this awesome person I want to be and to hide the person I think I really am and I’m always tired having to spend lots of downtime trying to recover, by crawling off to a place to hide to recharge just so I can come out and do it all over again. I know all this yet I still don’t know…enough! It sounds like this article un-numbed you and you did let yourself feel it. Geneen says it takes a courageous heart to come to retreat and I think that is also true about coming to this discussion. You have that, thank you.